Water leaks are inevitable when you live in an RV or camper. They happen, so you get used to watching for them. 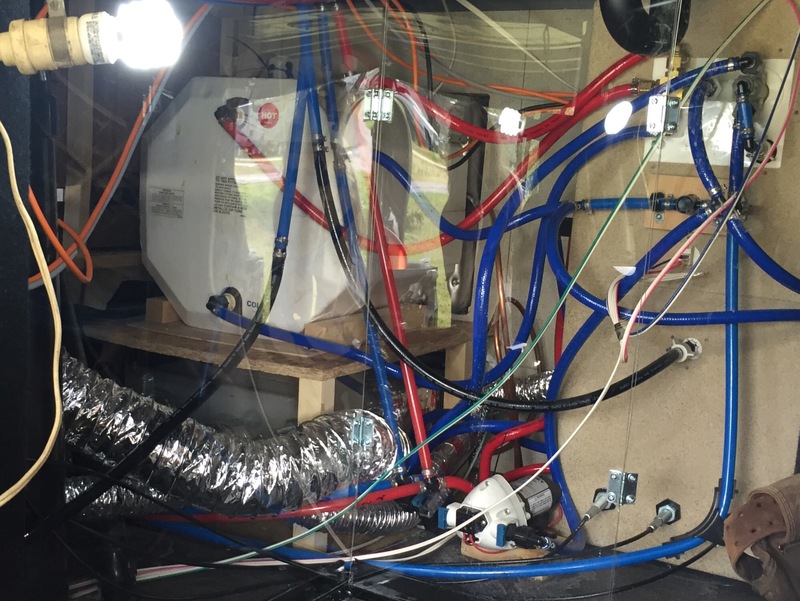 Part of the reason is that everything is pex and shark bite fittings hose clamps. The other is that your “house” rolls down the road on wheels. If it moves, it shakes, and if it shakes, it loosens… Inevitable. So the best thing in my opinion is to be aware and prepared. Our large cubby, which some people call the “basement”, is where the water connections are. There are wall panels put up to protect all the hoses and electrical wires and heating ducts behind the wall. And the rest is used for storage. Every time we’ve had a leak, it’s been right behind the water panel, where the city water connection comes in and splits off for hot and cold and the different faucets inside. Allen wanted to put up some plexiglass panels in place of the plywood that was there, so that we could see what was going on back there. When we took the panels down to measure them, we found another leak! Easy fix, and it was small. But we got that cleaned up and moved everything back a little. Allen was able to re-route some of the duct work and cables to give us a little more room even. We got the plexi cut at Lowe’s to the size we needed. And after cracking one piece, trying to drill holes to add hinges, a YouTube video told us to use a masonry drill bit. Never would’ve thought of that! But it worked! Masonry bits are flatter rather than really pointy. Luckily Allen has just about every tool there is so we didn’t have to go buy anything. Some metal roof flashing material along the floor held the plexiglass panels in place, and the hinges will allow us easier access. There is velcro along one end, so we can remove the whole thing quickly if needed. And now we will SEE a leak without having to remove anything. 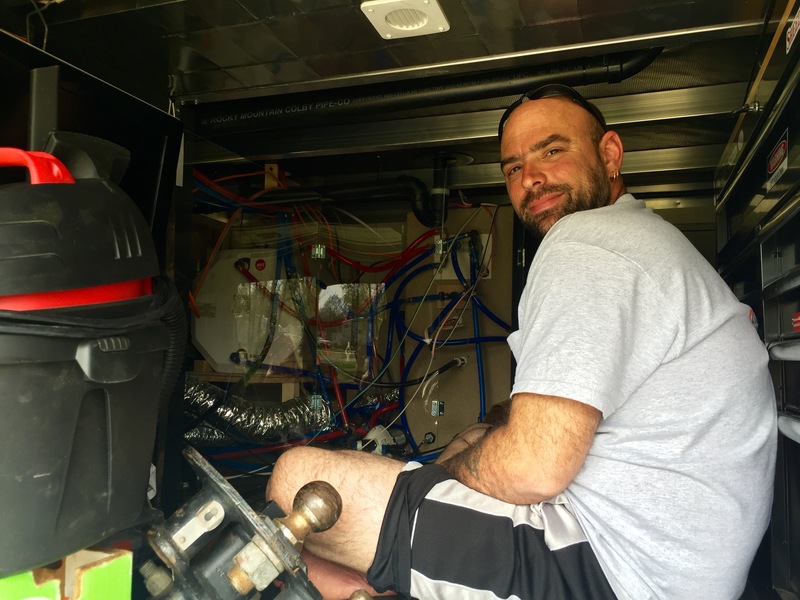 This entry was posted in 2015 Grand Design Momentum 385TH, Camper, DIY, Projects, RV and tagged 5th wheel, basement, camper, camping, cubby, DIY, fifth wheel, Grand Design, Momentum, RV, RVing, water, water leaks by Rachel Gillen. Bookmark the permalink. Use shark bite fittings and eliminate leaks. http://www.sharkbite.com When we spring a leak that is what is used to fix it. Cut and push together. After our p trap came loose, I put 3 leak sensors in different places near the plumbing. Amazon has them. That’s a good idea. Do they work well? How close do they need to be to the actual leak to go off? They need to get the probe prongs wet. Remote temp sensors are a good idea too. And propane remote too.It will tell you the % of full.